This is a black and white snapshot of Luisa Guagneli with Arturo Guagneli. It is unclear if this photo was taken before they were married or after. 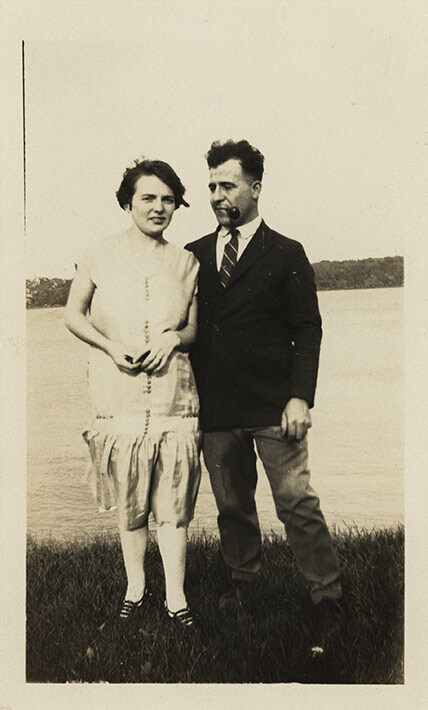 The two are standing on a grassy bank near a lake or a river. Luisa is smiling straight at the camera and leaning slightly towards Arturo. She is wearing a light-coloured knee-length dress with buttons along the front. She has on black shoes and white stockings. Her hair is styled in the usual bob cut. Arturo is staring at Luisa and he has his arm around her back. He is wearing a black sports coat, a white shirt, a black and white striped tie, dark coloured pants suit, and black shoes. He has a pipe in his mouth. The far background shows a tree-lined shoreline. This photo was taken on the same day as DICEA2011.0008.0014.